BOOM! Trump Just Saved American Tax Payers BILLIONS With EPIC New Deal! I think this is the perfect solution. Cut off federal funding to law breaking sanctuary cities and self-fund the wall. Then you can charge fees for travel back and forth and repay the treasury. Sounds like a winner to me. 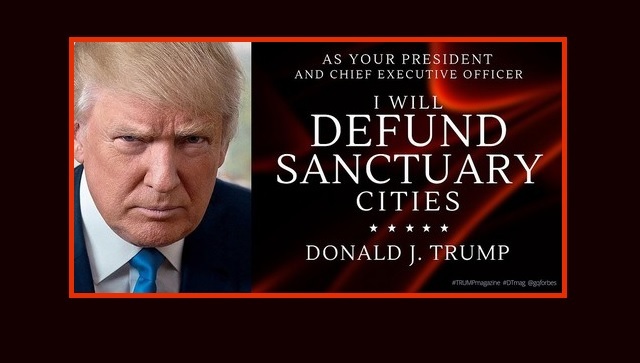 President Trump has vowed to cut off federal funds to sanctuary cities and I understand he is getting ready to do so. That’s $27.741 billion right there. If you don’t want to follow our rule of law, you should not get the US’ money. This is what I call leverage… it’s a hell of a big stick to smack cities such as New York, San Francisco, Los Angeles, Seattle, Portland and Austin with. OpenTheBooks.com identified 106 sanctuary cities in the United States in their oversight report this week. Surely they know what is coming here. Twenty-two percent of the roughly 11 million illegal immigrants in the United States live in just 12 American cities, according to the report. Those cities, which include New York, Philadelphia and San Francisco, received $15.983 billion in federal funds. One of President Donald Trump’s many executive orders that he has signed in his first two weeks in office was an order vowing to cut off funding to so-called “sanctuary cities” unless they agreed to work with the federal government in identifying and deporting illegal aliens. If Trump were to follow through on his promise, assuming these cities don’t end their sanctuary city status, the savings to the taxpayers would be staggering, a report by Openthebooks.com found. 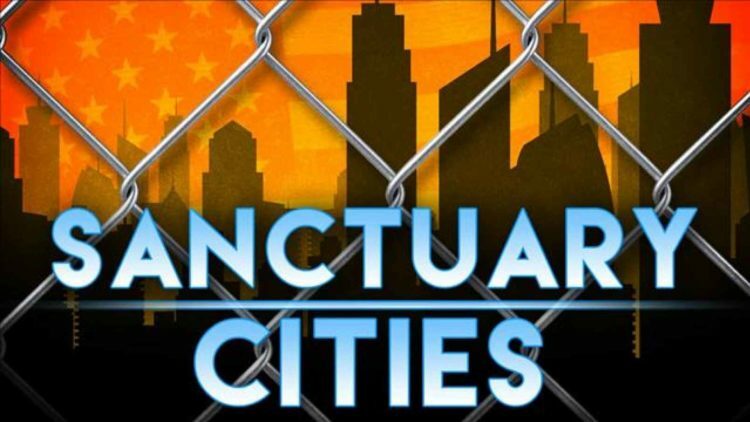 If the funding to all 106 sanctuary cities in the United States were ended, that would save an estimated $27.741 billion that is currently given to these cities either as direct payments or in the form of federal grants. Imagine everything that could be done with that money. We could build roads, bridges or even fund better military equipment for our troops. CNBC noted that some estimates claim that Trump’s border wall could cost as much as $25 billion, something fiscal conservatives and liberals have expressed concern over. Even though Trump has claimed that Mexico will pay for the wall, he has also admitted that the U.S. will probably start paying for it first. That $27 billion that is given to sanctuary cities looks like something that could be used to start funding the wall. Cutting off the funding for these rogue sanctuary cities is a great way to cut the fat and make examples of those who defy our laws. The cities receiving the highest amount of federal funding per capita, which “have the most to lose by maintaining their sanctuary status,” were Chicago and Washington, DC, which received $5.3 billion and $2.09 billion, respectively. The majority of federal funding went to local police and fire departments, schools, housing and city services, via grants worth $21.5 billion. Another $4.23 billion in direct payments went towards housing, education, community development and schools. Miami has decided to no longer be a sanctuary city in response to the EO. San Francisco filed a lawsuit. In fact, all of California is about to declare itself a sanctuary state and Trump will cut off all federal funding to the state if they do that. Per the Washington Free Beacon, Los Angeles, where “fully 1 in 5 city residents are illegal entrants,” received $502.5 million from the federal government. The report noted that more than half of the illegal immigrants living in the country reside in a sanctuary city. The 12 cities with the most illegal immigrants and the federal funding received last fiscal year are: New York ($7.6 billion), Chicago ($5.3 billion), Philadelphia ($590 million), San Francisco ($509 million), Los Angeles ($502 million), Seattle ($284 million), Providence ($235 million), Denver ($227 million), Austin ($207 million), Newark ($207 million), Portland ($174 million) and Minneapolis ($118 million). “Sanctuary jurisdictions across the United States willfully violate Federal law in an attempt to shield aliens from removal from the United States,” the executive order signed by Trump stated. “These jurisdictions have caused immeasurable harm to the American people and to the very fabric of our Republic.” President Trump will keep his word on this and it will save us a ton of money when he does.